June 2016. Not only humans but also each of their body cells must watch their fat balance. Fats perform highly specialised functions, especially in the cell membrane. A research group at the Buchmann Institute for Molecular Life Sciences (BMLS) of Goethe University in Frankfurt, together with colleagues at the Max Planck Institute of Biophysics, has now discovered how yeast cells measure the availability of saturated and unsaturated fatty acids in foodstuffs and adapt their production of membrane lipids to it. This opens up new possibilities to understand the production and distribution of fatty acids and cholesterol in our body cells and make them controllable in future, report the researchers in the latest issue of the “Molecular Cell” journal. A glance in the supermarket refrigerator shows: Low fat, less fat and no fat are en vogue. Yet fats are essential for cell survival as they form the basic structure for the biological membranes which separate cells from the environment and form functional units inside them. In this way, opposing reactions, such as the formation of energy stores and the consumption of fat, can be organised in one and the same cell. First observations that living organisms such as bacteria can actively control their fatty acid production were already made decades ago. Yet until recently researchers puzzled over how higher organisms, for example fungi such as baker’s yeast, measure and regulate the ratio of saturated and unsaturated fatty acids in their membrane lipids. Thanks to funding from the German Research Foundation and the Max Planck Society, the working groups headed by Robert Ernst at Goethe University Frankfurt and Gerhard Hummer at the Max Planck Institute of Biophysics have been able to investigate this fundamentally important question. In order to describe the mechanism of a membrane sensor which measures the degree of lipid saturation in the yeast cell, the researchers used genetic and biochemical techniques and simulated the motions and underlying forces of membrane lipids over a period of a few milliseconds by means of extensive molecular dynamic simulations. These efforts revealed that the sensing mechanism is based on two cylinder-shaped structures which are positioned next to each other in biological membranes. They both exhibit a rough and a smooth surface respectively and rotate around each other. “It’s like a finger in cookie dough that checks how much butter has been added” explains Robert Ernst. As saturated fats cannot be accommodated by the rough surface of the helix while unsaturated can, the fat sensor’s structure changes when the proportion of saturated fats increases. Intriguingly, this conformational change can control the downstream production of unsaturated fatty acids. 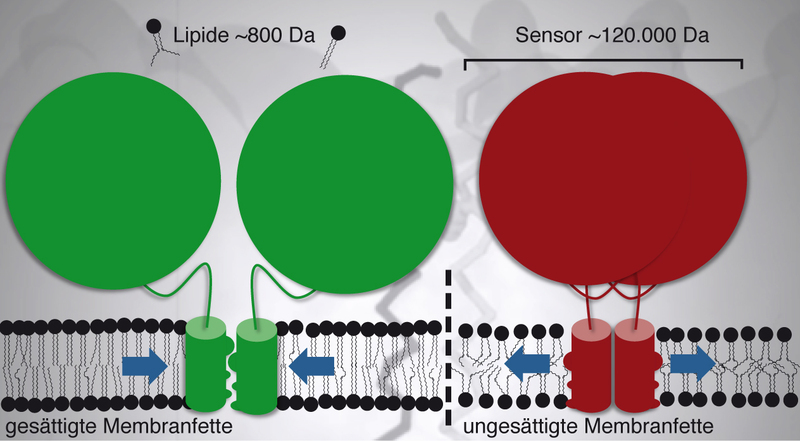 Figure: A membrane consisting of saturated membrane fats activates the sensor (grün) and initiates synthesis of unsaturated fatty acids while the loose packing of unsaturated membrane fats leads to inactivation of the sensor. The two cylinder-shaped structures in the membrane turn round towards each other so that their rough surface either faces inwards (green) or outwards (red). The fight of David, a membrane fat of 800 dalton (1 dalton correspond to the mass of one H atom), against Goliath, a sensor of 120.000 dalton, is decided through the collective forces in the membrane (blue arrows). Copyright Robert Ernst. “This finding paves the way for many more studies”, predicts Robert Ernst. “With our knowledge of this delicate mechanism in yeast we can now focus on finding new sensors in different organelles and species which monitor and control the production of unsaturated fatty acids and cholesterol in our body.” In view of the far-reaching potential of these findings, an international conference will be staged in the near future. The organisers, including researchers from Frankfurt, expect that the role of fats in many cellular processes will gain a new perspective. With increasing knowledge it might become possible to support hormone-producing cells in a more targeted manner. Robert Ernst, Buchmann Institute for Molecular Life Sciences, Institute of Biochemistry, Riedberg Campus, Goethe University Frankfurt, Frankfurt/Main, Germany, Tel. : +49 (0)69 798-42524, ernst(at)em.uni-frankfurt.de.